If you’ve been following my quest for the smallest program from the beginning, you know that we still have 54 extra bytes to get rid of. Next let us look at the code bracketing the top and bottom our main() function. …which does a call into our main(), and then jumps to the exit handler when our main() returns. Why does the compiler want to call into our code, only to jump to the end when our code returns? Wouldn’t it be easier just put the exit routine dangling after our code so that the execution would just naturally flow from the end of our program into the exit routine? One good explanation: It is important to call into main() so that can have a return at the end. The return makes it so that we can (theoretically) call main() from other parts of our program just as if it was a normal function. This makes perfect sense, except that the compiler didn’t put a return at the end of the main() function! Hmmm.. I am getting very mixed messages here. Either put a return at the end of the function or don’t call into the function – but not both. In fact, our code can never return because it has an infinite loop. I think the compiler knows this at some level and that is why it didn’t put in the return, but it forgot to tell the part of the compiler that generated the call. In any case, we don’t need the call, or the return. The exit code turns off interrupts and goes into an infinite loop. I can understand the loop – in general you don’t want a program to finish and then run off the end of the earth. I don’t understand why you’d want to turn off interrupts – to me intuitively interrupts should still keep working even after main() returns, but this is a matter of taste. The point is moot here because our little program has its own little infinite loop so it never finishes and never touches any of this exit code. Last time we looked at every one of the whopping 70 bytes of extra code that had accreted around our tiny little 6 byte program. Now we are going to start figuring out what we can get rid of. …which is setting the Status Register (0x3f) to zero. I wasn’t sure why you would need that, and it turns out that you don’t. The data sheet for this chip explicitly states that this register will always be initialized to zero on reset (page 10). I looked at a few others (including the ATMEGA328 used in the Ardunio), and these chips also make the same guarantee. Again, according to the chip specifications this code also appears to be redundant. The Stack Pointer (0x3e) is guaranteed to be initialized to point to the top of SRAM after any reset. I even tested this on an actual chip (harder than it sounds! ), and it really does get automatically set no matter how I reset the chip (power, WatchDog, reset pin). The code that sets the other register (0x3d) is just plain wrong for this processor. The spec shows this location as “reserved” (page 255) and “reserved I/O memory addresses should never be written” (page 256). So here are 10 bytes of unnecessary code that we can remove safely remove from any and every ATTINY4313 program (any many others) complied by avr-gcc. Think of the millions and millions of AVRs all around the world saddled with these extra 5 cycles of effort every time they reset! How does something like this happen? The avg-gcc is a massive software project that supports dozens of processors. It is a huge amount of work to create and maintain something like this and the people who work on it do an amazing job. Besides taking up a tiny bit of extra space and time, these superfluous bytes do not make any working programs crash, so finding and fixing stuff like this is very, very low on the the priority list. But to those of us (me?) obsessed with maximal minimalism, even 1 extra byte is too much to swallow. Tune in next time to see how these bytes – and more -are banished in search of the smallest program. We still have 54 more bytes to loose! How small can a C program be? DDRA|= 0x01;      // Set PORTA0 bit to output. First it sets pin PA0 to output mode, then it toggles it on and off as fast as it can forever. Which is pretty sort and sweet – only 6 bytes long! Note that I ORed the values into the registers so the compiler could use the set bit (SBI) instruction which is only 1 word long. It really doesn’t get any smaller than this. It looks like this is in fact our code talking to us, all 6 bytes of it. You can spot our little routine just after main(), but it is drowning in a sea of other code. Lets take each of these and see what they do and what we can do about them. When ever the processor gets interrupted from running normal step-by-step code, it will jump to one of these addresses based on what interrupted it. This is part of the defined behavior of the chip. If Timer 1 overflows, it jumps to vector #6. If the Analog Compare triggers, it jumps to vector #12. There are 21 vectors in all, each for a different source of interrupts. Each vector is really just an instruction to jump to someplace else, so each vector takes up 2 bytes. 21 vectors * 2 bytes/vector = 42 bytes. Note that the first vector (at address 0) is particularly important because this is the Reset vector. This where the processor starts up after a reset – including when it gets turned on. Here is the initialization code…. The first line clears register R1 to equal 0 (anything XORed with itself is zero). The compiler often needs a zero handy, so it dedicates register 1 to always and forever have a zero in it. This is how that original zero gets there. 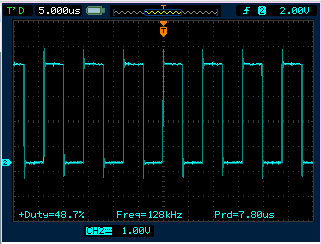 The next 4 lines set up the Stack Pointer (0x3C) to point to the top of RAM (0x5F). It also is putting an 0x01 in location 0x3E, which according to the chip’s documentation should be a reserved location an not used. Maybe this is a benign copy-paste error from another chip that supported a 2 byte Stack Pointer? The last line calls into the main() function of our C code. This looks like just a vector for other vectors to point to, and all of the unassigned interrupt vectors point to it. The Bad Interrupt Vector itself just jump back to the reset vector. This mans that if, say, you get a timer interrupt and you have not set up a vector for it, then the processor will first jump to the Timer Interrupt Vector, which will send it to the Bad Interrupt Vector, which will send it to the Reset Vector, which will send it to the Initialization code. Seems like it would be much easier and more efficient just to have all the unassigned vectors point directly to wherever you want them to go (currently the Reset Vector). This is code that executes when the main() function returns (ours loops forever so this never happens in our case). All the Exit Routine does is turn off all interrupts and then loop forever. Again not sure why you’d do this – I can imagine writing a program that was completely interrupt driven and just sets up all the interrupts in the main() and then returns. Because this Exit Routine turns off all interrupts, this wont work and I must add an extra while(1) in my main(). At least there is nothing magic going on here – we can see exactly where all of the extra bytes are coming from, and figure out why they are there (or don’t need to be!). Tune in next time for some drastic cutting…. Turned off all unused units like the analog comparator, Timer0, USI, and USART. Saved about 0.2mA. Not much, but I guess worth the tiny amount of effort. PRR = PRTIM0 | PRUSI | PRUSART;        // Turn off Timer/Counter0, USI, USART since we don't need them. Saves about 0.1mA. Brownout detector already off via fuses. Won’t really worry about setting IO pins to output since the input is disabled during sleep and we will be asleep almost all the time except when updating display. I guess it is now all about maximizing time in SLEEP!